Every Saturday, in the place known as "the city in the country", the streets open up to a world that was intended for a time unknown or forgotten to most; a place where neighbors actually talk without electronic devices, where bright eyed children board a train conducted by kind volunteers and where locals come for everything from decadent French pastries to vegetable smoothies and strawberry kambucha. 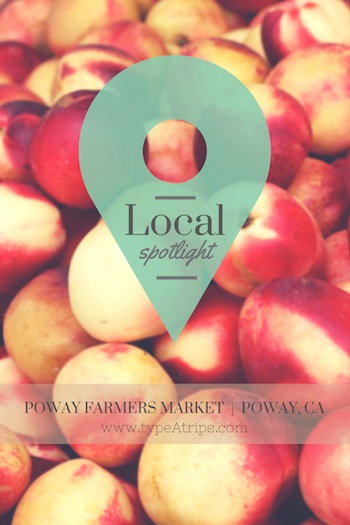 The Poway Farmers Market has become the best community event of the area and for good reason; worthy of regulars who live close by (like me) or visitors from afar looking for a rare glimpse into a safe spot filled with family centered fun. Farmer Steve is a great guy who carries a variety of organic produce at very reasonable prices. He always has a story to tell or a word of advice, but most importantly is the only person in the area that sells passion fruit for way less than anyone else in town. I call him my dealer, since passion fruit has become my drug of choice to help satisfy my sweet tooth! The Loose Leaf carries a collection of teas that range from weight loss to energy enhancing based on all natural ingredients. Meghan, the sweet girl at the booth always has samples to try and provides a detailed breakdown of each tea so you make the best choice (my favorites are the Detox and Organic Cacao & Mint). There is also a booth that sells all natural, local honey; Asana Foods carries gluten free granola and chocolate; and Bernardo sells bunches of wild flowers so you can make your own bouquets - most 3 for $10. We love the food here and find any excuse to grab a bite to eat. Corbin's Q grills mouth watering bbq ribs and tri-tip right in front of you on their outdoor grill cart with their scrumptious homemade sauce, La Creperie crepes are juicy good - I like to get Porky's Favorite with an egg and Colin's go-to is the Mexican food booth with the shrimp ceviche and delicious fish burritos... you really can't go wrong with any of them! I also suggest washing it all down with a glass of fresh squeezed orange juice or a bottle of strawberry kambucha! Finally, the crowning jewel is the Poway Midland Railroad, fully equipped with a small scale platform and ticket office, where for $.50, kids wave to onlookers as they ride around the park while the conductors and attendants run the show. Operating every Saturday from 10am - 3:45pm and Sunday from 11am - 1:45pm, you can ride one of the fully restored trains (steam locomotive, speeder or SF trolley) depending on the week. It's one of those rare occasions where you really feel like you've stepped back in time to a better, slower, safer place.